Wolves have signed Sunderland goalkeeper Darren Ward on loan until the end of the season. Ward, 34, will provide back-up to Wayne Hennessey and Shane Higgs following injuries to Matt Murray and Carl Ikeme. 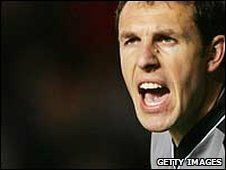 The Wales international has made almost 600 senior appearances during his career including spells at Mansfield, Notts County and Nottingham Forest. Wolves manager Mick McCarthy told BBC WM: "He's a good character around the place and hugely experienced." "We're just being on the front foot and doing something before we have any, if we did have any issues, to get cover and a really experienced goalkeeper," he added.